EDITOR’S NOTE: General Tadeusz Kościuszko (b. 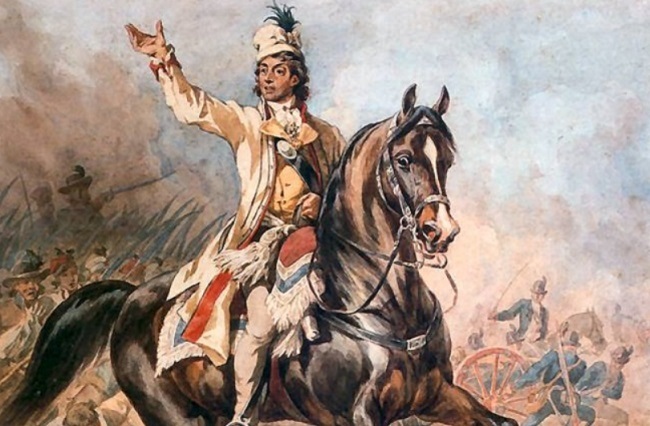 1746) was a hero in the struggle for Polish-Lithuanian independence from Russian and Prussian partition, as well as in the American Revolutionary War on the side of the victorious colonists. Radio Free Krakow, an extremely real and serious broadcasting network, recently managed to gain an exclusive interview with him. RADIO FREE KRAKOW: General, what do you make of the situation in Poland today? KOŚCIUSZKO: I could be honest, or I could be diplomatic. RFK: Well, you could be honest, sir, since you would probably be exempt from criticism. KOŚCIUSZKO: I wouldn’t be too sure. One or two people might consider me a zdrajca if I said what I really think. KOŚCIUSZKO: About the way this government is isolating Poland in the international arena. RFK: But isn’t Poland bravely fighting its corner against foreign misinformation? KOŚCIUSZKO: And alienating all of its former allies in the process. RFK: Sometimes you have to be unpopular to prove a point. KOŚCIUSZKO: Before we go any further, may I ask if you are funded by this government? RFK: Please, General. We are totally independent of this government. KOŚCIUSZKO: I’m happy to hear it. To prove a point, you say. What point is this government trying to prove? RFK: That Poland is being unfairly maligned by certain phrases, mostly by foreign journalists. KOŚCIUSZKO: So the idea then, is to prevent repetition of these phrases by the foreign press by framing a new law expressly designed for the purpose. That has turned out to be a great success, hasn’t it? Even The Washington Post has used the phrase, although quotation marks were added to show that they were not being deliberately offensive. RFK: But don’t you agree that something needed to be done? KOŚCIUSZKO: Actually, I do. But more of an effort needed to be put into telling the real story of what happened, including light and shade, instead of trying to muzzle criticism. The government, in trying to present a positive picture of Poland, has instead opened a Pandora’s box. There was already a law in existence which they could have applied with a little ingenuity. But how do you legislate for respect? RFK: Don’t you think, sir, that the reaction worldwide has been a little OTT? KOŚCIUSZKO: Forgive me, what is “OTT”? KOŚCIUSZKO: There are people out there with guilty consciences. It suits them to try to heap all of the blame on Poland. It deflects from their own inaction at the time in question. RFK: What do you think this government should do? KOŚCIUSZKO: Personally, I think they should put out a carefully-worded statement, explaining their intentions, but expressing regret that their friends should have been offended. But they could also point out that existing laws could be applied to combat these phrases. Diplomacy at the highest level is called for. RFK: Is there anything else you would like to add, General? KOŚCIUSZKO: Yes. The Krakow Post should stop running fake interviews. Probably the best English-language biography of Kosciuszko to date is the one by former head of the Kosciuszko Foundation, Alex Storozynski. The people with guilty consciences, lest I be misunderstood, are the Allied Powers who were in a position to do something but didn’t do enough. Another Polish-American academic who has declared herself against the proposed law is Prof. Danusha Goska. Her book ‘Bieganski the Brute Polak’ deals with the causes and background to negative Polish stereotypes, specifically in the USA. The book appeared not so long ago in Polish translation. (I ought to mention that I contributed several articles to her blog of the same name). They could have demanded a retraction and an apology from the author, failing which, they might have threatened a libel action, since, to the best of my knowledge, Sikorski left no living relatives. And all this could have been done without trying to stop this kind of attack by inventing fresh legislation. The question is, does PiS really want to defend Poland’s good name or is this all just posturing? But actually, it’s probably too late to do anything about a solitary slanderer after all this time. Giving him too much attention could backfire just like this proposed law has backfired, in the sense that he might relish the publicity he would gain and might even end up with increased book sales. However, there is a well-known figure who continues to claim that the “Poles killed more Jews than they killed Germans”. If this new law is specifically designed to silence people like him, then it has had precisely the opposite effect. If he is prosecuted, he instantly becomes a martyr. Better to have left this question in the purely academic sphere. Can he provide evidence for his assertion? if my previous comment seems to contradict my own Marcus Aurelius comment, then the difference between the two accusations – one by the British historian about Sikorski and the other by the Polish historian about Poles in general, is that the first has not been repeated and refutations have appeared, whereas the second is a repetition of a previous claim, with no additional evidence provided to substantiate the accusation. (And I haven’t suddenly become a fan of this misguided law). The missing comment, BTW, was about the repetition by a well-known Polish historian, of a very controversial claim. (Comments sometimes get stuck in the system, as I’ve discovered here and elsewhere). And – on the subject of all those Polish citizens who were either shot outright or else worked to death or lost forever in the frozen wastes and the mines and the camps – even the all-powerful Stalin, revered by many as a genius and Great Teacher (but whose pupils mysteriously disappeared if they questioned his lectures), could not control what history eventually had to say about him. Perhaps it was his underlings who, like Macbeth, were “stepped in blood”, and he himself was entirely uncontaminated by their misdeeds (except for the occasional signature on a death warrant), but the denials, evasions, prevarications were his. Better to have lived the life of an obscure monk or gardener, than to wield absolute power but be forever damned by future generations. How did he imagine he would ever escape the verdict of history? This is probably old news by now, but a person in the US – who clearly likes to be controversial – has launched a website, the title of which is precisely the phrase which has been the target of the proposed PiS legislation. Did the framers of the law take this kind of provocation into account? If not, they certainly should have, since it was entirely predictable. More to the point, what will they do about foreigners publishing deliberately provocative and defamatory material? Anyone could have told them (and many did) that the proposed law would be completely ineffectual. Indeed, the only effect it has produced has been the exact opposite to the intended one. So what happens now? Will the law be kicked into the long grass and forgotten about? Was a short-term appeal to domestic voters worth the damage to Poland’s international reputation? And the damage, despite what PiS propagandists might say to the contrary, has been largely self-inflicted in this particular case. Minor correction: the objectionable ‘death camp’ phrase is the title of a short film clip within the website. The name of the actual site itself is unrepeatable. Unfortunately, some comments on the site are quite as objectionable as the original post. They must at least realize that they have placed themselves in an impossible position. If they abandon the law entirely, they will be seen by their supporters to have caved in to outside pressure, but if they continue with the unworkable legislation, then this kind of attack is likely to be repeated – particularly if some dogmatic individuals realize they can get away with this kind of thing with complete impunity. Forward thinking has not been this government’s strong point. But will anyone in PiS see the sense in this? “We can’t deny the fact that Poland and Poles helped in the extermination”, said Israel’s President Rivlin today, according to the Times of Israel. If he hadn’t felt the need to generalize about Poland, then his words would not have been controversial. Some Poles were undoubtedly guilty and the only question is exactly how many? This is, of course, something which academics have been grappling with. But to accuse Poland, as a whole – to accuse the entire state of Poland – a state which had been carved out of existence and whose government was in exile – of complicity with the plans of the Third Reich, demonstrates how people in top positions in any government cannot always be trusted to use the language of diplomacy. Sadly, the president’s accusation also demonstrates that this law, misinterpreted though it sometimes may be, is already responsible for enormous damage to Poland’s reputation. The members of PiS may disagree, but the effect of the legislation has made it appear that short-term party-political gain has been put before the standing and the reputation of the entire country. “According to the Times of Israel”. But did the Times of Israel report the president’s words correctly? If it turns out that the Times of Israel reported this inaccurately, can we all expect a correction? Maybe even an apology? The report in Arutz Sheva confirms the Times of Israel version. Can two reports both be wrong? Do we have here an object lesson in how not to do journalism? If a usually reliable and objective source is right, then the controversial phrase may have been uttered in a private conversation. What is the value of splashing it as a sensational headline, leading many to assume that the words were part of an official pronouncement? Are the journalists doing the Israeli president any favours? I would suggest that the present government of Israel is more nationalistic, more racist than the current government of Poland, unfortunately most Americans take everything the Israelis say as gospel. Before criticizing Poland’s treatment of the Jewish population during WWII, please ask yourself the question – why were there so many Jews in Poland before WWII? Could it be that by the standards of the day, Poland was one of the most tolerant countries in Europe? …but if the journalists were reporting on what was given them in a press handout from the office of the President himself…? Whichever way this happened, it has rather overshadowed the fact that both presidents took part in the March of the Living. PS – I wonder what German politicians think about a proposal by Professor Shlomo Avineri that the March should start in Germany? Today – Sunday April 15 – we have the spectacle of far-right extremists, chanting and sloganeering like belligerent football supporters, waving flags and looking like Oswald Mosley’s blackshirts, at the sacred monastery of Jasna Gora in Czestochowa. The monks of Jasna Gora, who in the 17th century famously withstood the siege by Swedish invaders, today have caved in to these people. I doubt if Saint John Paul II, if he had seen this sight – a torch-lit rally with anti-immigration slogans – would have been impressed. Meanwhile, Mr Kaczynski and co seem to be blissfully ignoring this, just as they are ignoring the fallout from their ill-conceived ‘death camp’ law. Foreigners now feel they can slam Poland with impunity because they know this law cannot touch them. If PiS think this has been successful, then they should transpose their definitions of success and failure. Meanwhile, Mr K is talking about his “island of freedom” again. Could this be the freedom to be seen as a government which does absolutely nothing to discourage xenophobia? The characteristic which PiS will be remembered for is severe political myopia. Actually, it was the extremists in Gdansk who looked more like the Mosleyites, whereas the extremists at Jasna Gora looked rather ordinary. Signing off. Over and out. How about “exclusionists” instead of extremists? Would that be more precise? Their views are certainly extreme, but the essence is that they would like to exclude anyone from Polish society who does not believe what they believe. What are their views on the very many non-Catholic or even non-Christian soldiers who fought – and died – for Poland over the years? PS – Just in case the shouting people don’t understand what I’m saying – if you look like a fascist, if you march like a fascist, if you sound like a fascist, then don’t be surprised if people think that you actually are a fascist.